North Central College provides faculty, staff and students with a quick and easy way to change a password or reset an expired or forgotten password. To help maintain password security, ITS is unable to perform password changes over the phone. IMPORTANT: The password reset tool will only work to reset a forgotten password if you have already logged into the tool and configured your security questions. If you have forgotten your password and have not already provided answers to your selected security questions, you will have to visit the ITS Help Desk in Carnegie 110 with a picture ID to have your password reset. 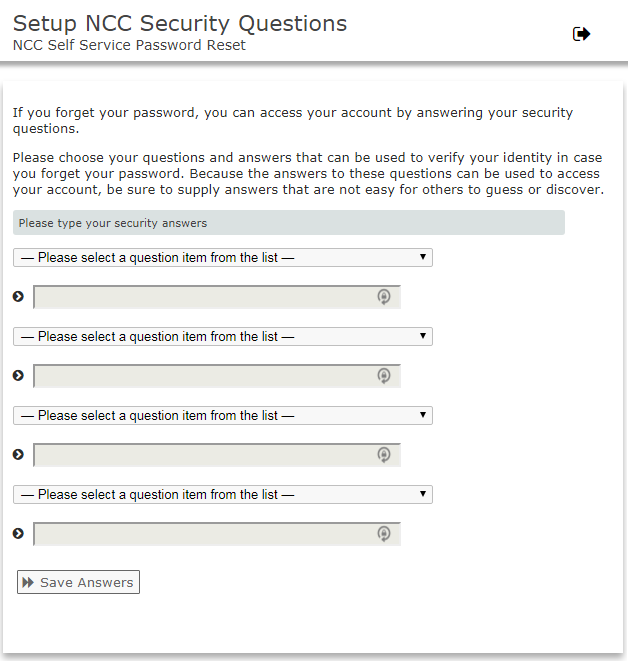 Login using your current NCC username and password and click "Sign In"
You will be presented with a screen to select your security questions. You will need to select and answer four security questions. Please select questions to which you will remember the answers. Please Note: When you answer these questions in the future, your answers will need to be entered exactly as originally typed. After your security questions have been sufficiently answered, click "Save Answers." You should receive a screen confirming that the security answers have been saved. Click "Continue." You will automatically be logged out. 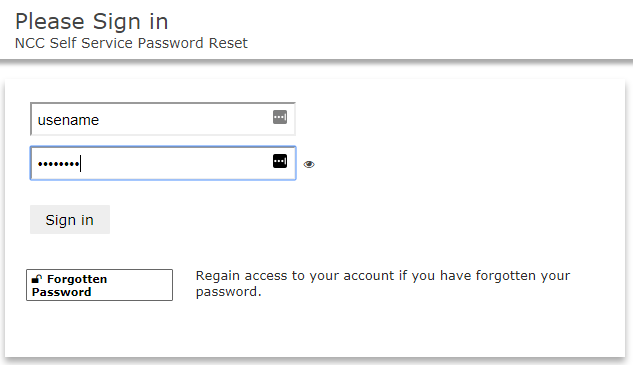 After you have configured your security questions, you can reset a forgotten password using our Password Reset tool. Please follow the steps below to reset a forgotten password. In the "Forgotten Password" window, enter your NCC username and check the box to confirm "I'm not a robot." You will be presented with a grid of pictures. Follow the on-screen instructions to select only the pictures meeting the specified criteria. Click Verify. After you have verified you are not a robot, you will be presented with two challenge questions that you must answer correctly. Click "Check Answers." Please Note: Answers must be typed exactly as you initially entered them (including spaces, uppercase, lowercase, symbols etc.) If you receive a "Security violation has occurred" error message, your answer did not match the original answer provided. After your answers are verified, you will need to select a new password. The requirements that your new password must meet will appear on the screen. As you type your password in the "New Password" field, it will be evaluated for strength. Please choose a password that is rated as "Strong." Retype the password in the "Confirm Password" field. Click the "Change Password" button. A box will appear indicating that your password is being changed. Please do not close out of your browser during this process. When the process is complete, you will receive a message confirming that your password change is complete. Click "Continue." You will automatically be logged out. Please follow the instructions below to change your password. You do not need to "reset" your password if you still know your current password and it has not yet expired. Enter your current NCC username and password and click "Sign in." Select a new password that meets the requirements presented on the "Change NCC Password" screen. As you type your password in the "New Password" field, it will be evaluated for strength. Please choose a password that is rated as "Strong." Retype the password in the"Confirm Password" box and click the "Change Password" button. If you have forgotten the answers that you have provided to your security questions, please clear your answers and re-select new security questions. Please provide answers that you will remember in the future. The list of questions you have already configured, along with the date and time when the answers were provided will appear. Click the “Clear Answers” button. You will be presented with a screen to select your security questions. You will need to select and answer four security questions. Please select questions to which you will remember the answers. When finished, click "Save Answers"
You should receive a screen confirming that the security answers have been saved. Click "Continue." You will be brought back to the main menu. Please logout of this portal. Every account, computer or device containing any data you do not wish to lose should be protected with a strong password. In the event you lose your computer or a mobile device, a well chosen password will be your first line of defense. Below are some tips to help you create better passwords. The password should be at least 8 characters, and remember, LONGER IS STRONGER. Start with a phrase: "John likes to eat cookies"
Use the fist letter of each word with the first word being an uppercase letter: "Jltec"
Next add the name of the website you are visiting: "JltecAmazon"
Substitute characters for letters: Change all "E's" to a "3", all "A's" to the "@" symbol, all "S's" to "$"
The password then becomes "Jlt3c@m@zon"
When creating a password, you should never use information such as your name, birthday, SSN, phone number or words that can be found in the dictionary.